Took it to the range for the first time. After all the internet chatter about Kel-Tec quality and issues with adjusting the gas I was not sure just what to expect. All I really did was put a LimbSaver on the stock for added protection to my old tired bones. First shot the mag fell out due to user error. I picked it up off a support on the table I was shooting off and securely inserted it and tested to make sure it was seated well. Four quick bangs and a quick check with my Nikon P900 camera with 84X camera. Five more quick bangs and another check with the camera. I was using a Nikon 233 3X9 scope aiming at a Champion Sight-In Target. Only thing I had done was put a laser bore sight (one of the .22 to .50 cal) in the barrel in my living room and minor adjustments on the scope. It was a little low and to the right. Being low is ok for the 50yards I was shooting at. All the rounds were with in a two inch diamond. Time to start scouting for hogs to shoot. Reloaded the mag and two more five shot groups, all in the same low and to the left diamond. Then I remembered all the stuff I read about moving the gas adjustment and up one click at a time till the semi auto worked, or was I suppose to move it down one click. Didn't matter cuz out of the box it was just bang, bang, bang as fast I could pull the trigger. While I am happy with the LimbSaver I have to say the recoil was a lot less than I expected. All this was after the .22 silhouette rifle and pistol match that took up most of the mourning and it was getting hot and the Florida afternoon rain clouds were building. I had not really planned on doing anything with the RFT except see how it would shoot on it's first outing so I packed up and headed home. Next trip I will allocate time to really sight it in. But I have to say it kinda shocked me that out of the box the RFB shot like a dream with less recoil and tighter groups than I expected. Nice to hear. Still want to pick one up personally, but I'm sorta holding out for a .308 RDB. I wanted a big boy toy to hunt hogs in the brush and swamps of Florida where a 'short long gun' has real advantages when stumbling through the brush and sometimes ankle or knee deep mud. As a rule all shots are under 50yards, probably fifty feet. I have a FN P90 which is stupid fun to shoot but probably not really enough stopping power for a big pig. So far I have been really impressed with how the RFB is to put rounds down range with better than expected groups. I have no doubt I can improve once I really break the weapon in and zero in the scope. I was using the el cheapo steel .308 rounds in it since that was what I had laying around. The range master noted that it would be better if I used brass stuff at the range. While this is not really a long term review on first blush the RFB was much better than I expected. I get your like of the RDB and am still considering one, but unless it was a .308 it would sorta over lap with the function of my P90. One other consideration (even if I have never seen claims of problems with the new RDB like when the first RFB came out) is that sometimes it takes some time to work out the kinks of a new weapon. Bottom line is that now the kinks seem to be worked out of the RFB, at least the one I got. good stuff tommy. i've always wanted the 24" hunter version and still do. i'd like to setup like below with the long pic rail sleeve. thanks to range rentals and firearm festivals in the area i've shot it enough to like. and likewise, have never had or seen issues with it. out of box the gas is set to a 'universal' setting. but, i'll fine-tune to the ammo for max efficiency. and i agree, it's a very soft shooting 308. personally, i own an RDB and have never needed to work out any kinks. i'm pushing 3k rounds on it currently without a single stoppage or jam except for the initial out of box gas tuning to run with as little gas as possible. it's also one of the cleanest guns i've worked with...really stays clean. tommy, I've mentioned this before, but most have gotten some of their better accuracy out of steel cased ammo with the RFB. Without going into detail, it's because of the chamber design. As to your reliability experience on your outing, this is more normal than one might expect. 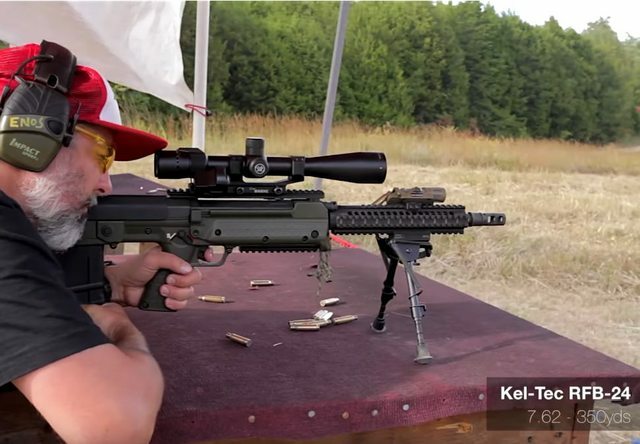 Also I'm beginning to wonder if at some point in production that Kel-Tec has finally gotten most or all of the gremlins out of this rifle, because your experience, mine, and many others has seemed to have gotten better and better...but honestly I have no idea. I do know that Kel-Tec has made tweaks to this gun without any announcement or warning...different gas pistons, different bolt coating, etc. I like mine, and it's been totally reliable with all ammo being brass between 147g to 168g. So far the only way I've gotten it to choke was when playing with the gas to intentionally find the adjustment limits. Tommy. The gas adjust probably cannot be adjusted far enough to make it not semi-auto. The test for the gas adjust is wether it will lock open on an empty magazine or not. The goal is to have the gas adjuster/vent screwed open as far as possible and still lock open on an empty mag. You test it by loading only a single round in a magazine and firing. Have not shot it since my last post. Probably going out tomorrow and will do as you suggest. I'm a fairly recoil sensitive shooter, and I have always found my RFB to be as pleasant to shoot as my AR10's...which is to say smooth, not harsh at all. Semiautos almost always have softer recoil than caliber equal bolt rifles. Still, if one feels the need to install a Limbsaver, options are good. I definitely have one of those aggressive, little shock absorber style Limbsavers on my KSG. It really works on that shotgun. Has there been chatter of a 308 RDB? Because that’s what I want. Semiautos almost always have softer recoil than caliber equal bolt rifles. The MDR is the reason that statement is "almost always". It kicks like a mule.